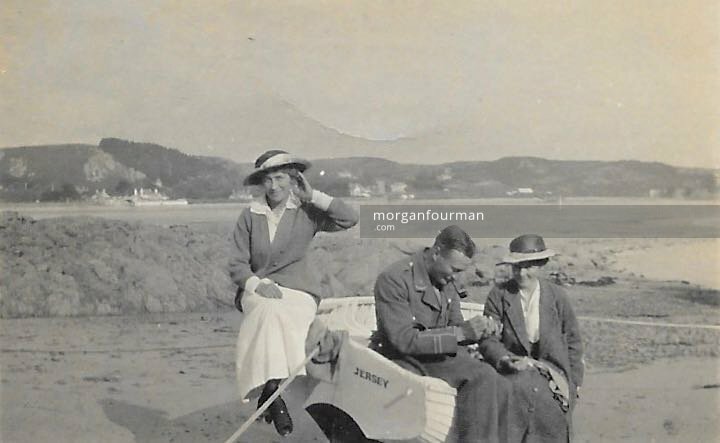 In Oct 1915 Molly Evans made a trip to Jersey and spent about 10 days with Wilmot Evans. It was the last time she saw her brother. 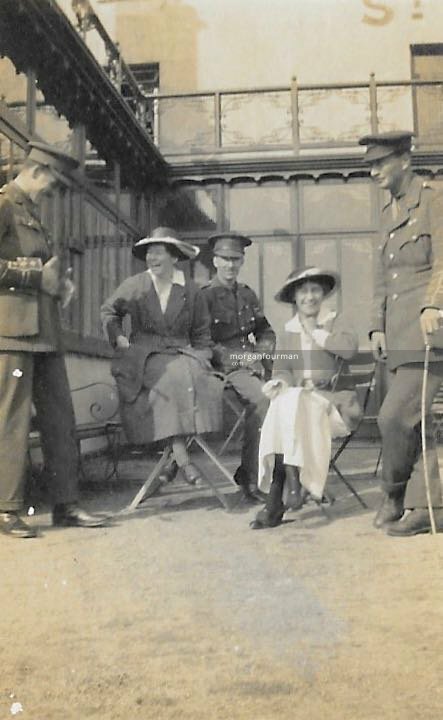 At that time she had already left Studley Court Hospital, Stourbridge and was awaiting orders for the next appointment. 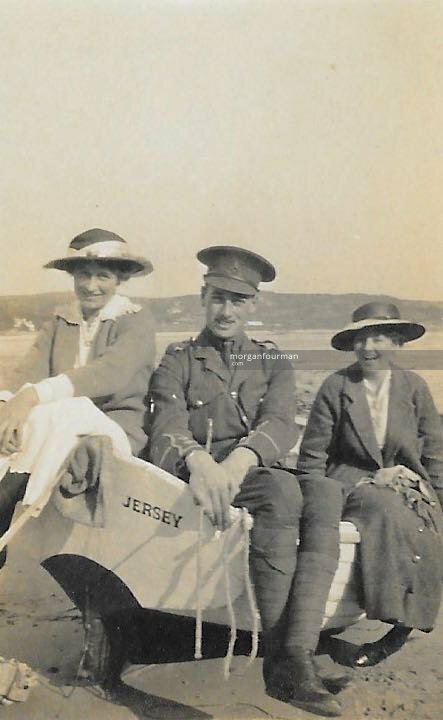 She left Hagley on 29 Sep 1915, took the overnight ferry from Southampton and arrived in rough sea conditions in Jersey late in the morning of 30 Sep. Wilmot has just learnt he had been promoted Captain and the brother and sister ‘talked till dinner’. 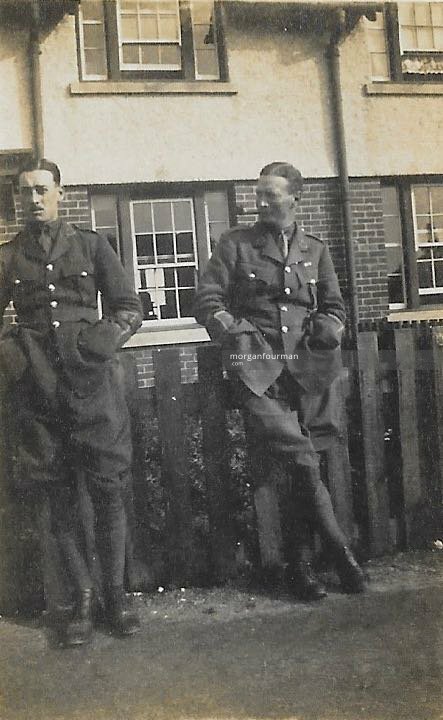 Molly met many of Wilmot’s fellow officers such as Mr Hassell (sic) and Captain Townshend and attended a number of dances and dinners. The picture above shows a late autumn day on the beach near St Peter’s, far from the horrors of the war. From a letter to Mary Downing, we know that Molly stayed with the Walker family, and the other lady (seated right) is therefore probably Daisy Walker, who was teaching Wilmot to sing. She eventually married Captain Townshend in 1918. Molly returned to Hagley on 11 Oct leaving by the boat at 5.30am and was back in Hagley by midnight. A large number of photos were taken in Jersey and were sent back to Hagley by Wilmot arriving in the post on 27 Oct, the very same day as her orders for abroad. Molly left for France on 1 Nov travelling via London, Folkestone, Boulogne and Rouen. On 5 Nov she joined No 2 General Hospital, Le Havre. In Nov 1916 Molly writes that she has been working thirteen months without leave.